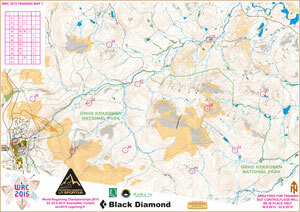 Training map for World Rogaining Championships 2015. As the event is closing we are not any more able to send training maps to you but the ordered map will be ready for collection at the competition office. You will have very good opportunity to training in summer 2014. In midsummer there will be Midnight Sun Rogaining on 20.6.2014 in Pyhä. More information you can find Midnight Sun Rogaining webpages.